Houston Ballet (in Houston, TX) strives to inspire a lasting love and appreciation for dance through artistic excellence, exhilarating performances, innovative choreography, and superb educational programs. 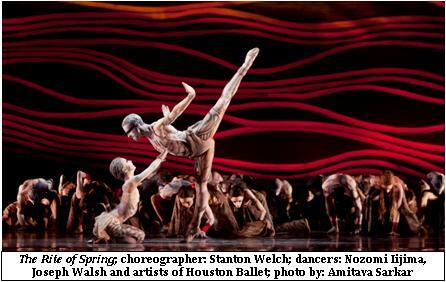 What new work is Houston Ballet preparing to kick off its season? 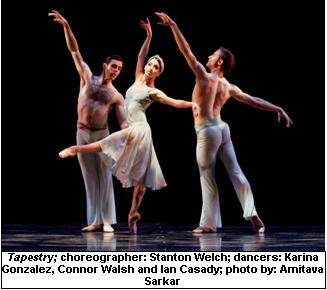 To celebrate the launch of his tenth anniversary as Artistic Director, Stanton Welch has commissioned three new works and an American premiere for the program Four Premieres in September 2013. This evening of work highlights new works from both established choreographers like James Kudelka (with his new ballet Passion set to Ludwig van Beethoven's Concerto for Piano in D, Op. 61a) and Christopher Bruce (the American premiere of his 1984 work Intimate Pages set to Leoš Janáček’s String Quartet No. 2) as well as emerging choreographers like Garrett Smith (with his piece Return, set to music by John Adams) and Melissa Hough (...the third kind [is] useless, set to music by Gabriel Prokofiev). Both Smith and Hough got their start as choreographers through Houston Ballet’s choreographic workshops, and went on to win fellowship grants from the New York Choreographic Institute. How does Houston Ballet’s educational programs promote diversity and accessibility? Chance to Dance: offers eight free ballet classes to inner city children who might not normally have the opportunity to study dance. Children who show promise in the initial eight classes are offered scholarships for further study at the Houston Ballet Academy. Three Chance to Dance students have gone on to appear with the professional company in performances of The Nutcracker. Dance for Parkinson’s: This collaboration between Houston Ballet and the Houston Area Parkinson’s Society offers weekly dance classes for individuals living with Parkinson’s. The classes provide an opportunity for exercise and creative exploration and expression with a specially trained instructor. Adapted Dance: Houston Ballet is excited to partner with the Down Syndrome Association of Houston and the Easter Seals of Greater Houston to offer Adapted Dance, a series of free dance classes for children, ages 5-12, with Down syndrome. Classes emphasize strength, flexibility, and balance while encouraging creative expression and teamwork. Describe your organization’s mission and its work in three adjectives. Please explain the adjectives that you’ve suggested. Excellence: At Houston Ballet, we evaluate excellence from three different perspectives. First, from our audience: As an audience member, would this be a season that would entice me to subscribe; does it captivate me, draw me in, and command my attention? From a dancer’s perspective: Is this a season with repertoire that excites me and makes me want to perform? Does it inspire me as a dancer? And from a financial management perspective: Is this a season that is financially viable and realistic? Does it ensure the fiscal health of the company? Innovation: New choreography is incredibly important to Houston Ballet, and we strive to create experiences that are new, cutting-edge, and have not been done before. This spirit of innovation should permeate all aspects of the organization: in our administration and management of the company; in our fundraising techniques; and our marketing and promotional strategies. Exhilaration: The key questions that we ask ourselves at Houston Ballet are: How do we keep the students in our school exhilarated? How do we keep our dancers excited about the works that they are learning and performing?